The thing that made Gargoyles the second-best action cartoon of the '90s (surpassed only by Batman: the Animated Series) was the writing. It was deep, complex, and never talked down to its audience. And part of that was its choice of villain, David Xanatos. The thing that set Xanatos apart from other villains is that he's, well, not a villain. Oh, he's definitely the show's main antagonist, but he's not evil, and never vindictive. He's more of a con man, manipulating people to achieve his own ends than trying to hurt them. And audiences love con men! With just a slight perspective shift, we could have been rooting for Xanatos to get one over on all the uptight people around him. For the most part, Xanatos was just a guy in a suit; and not even a colorful suit, a grey suit with a black shirt. That's hardly the type of thing toymakers would be falling all over themselves to make, so this toy depicts him in his Steel Clan Battle Armor. 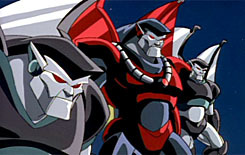 Xanatos was so impressed by Goliath that he built an entire cadre of robots that looked just like him, dubbed the "Steel Clan." When that wasn't good enough, he also built himself a suit of armor that looked just like the Steel Clan, except painted red instead of grey - thus, "Steel Clan Battle Armor." This one was released in Series 2 of the toyline - Kenner released the same one in Series 1, but it was silver/grey, not red. And while a similar thing did appear in the cartoon (as part of the "Iron Clan"), it wasn't until Series 2; ie, after the toy. So for show-accuracy, this is the one you want. The toy has more detailing than the animation model, because that would have been way too hard to draw. The full suit of armor comprises boots, gloves, a chestplate, a rocket pack, and wings. The boots have three toes, just like the Gargoyles, and angled plates of armor covering the shins. The gloves have three fingers (rather than the four which, on the show, served as a clue that this red "robot" was more than it seemed), heavy red armor on the forearms, and black tubes that run up to connect to the triangular shoulder pads. 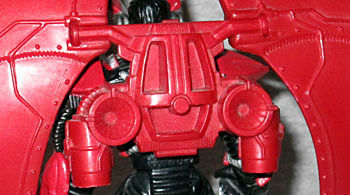 His chestplate has a few loose wires, suggesting he's been through a fight, and in addition to the massive riveted wings, his backpack also has turbines and rocket exhausts. 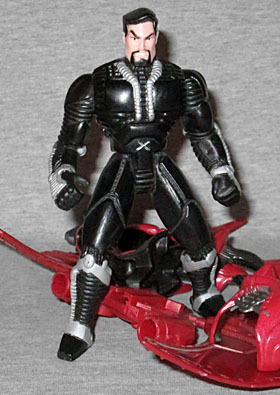 The suit's Goliath-inspired faceplate flips up, revealing David Xanatos beneath. He was voiced by Jonathan "Riker" Frakes, and even looks a bit like him, as well (a pure coincidence - the character was designed before he was hired). He didn't often look this angry on the show, but the sculpt is very true to the animation. He's even got his stylish '90s-guy ponytail! All the armor is removable, leaving Xanatos wearing just his highly advance technological undersuit. It's just as intricately sculpted as the armor, even though we ever saw anything like it on the show. The whole suit is ribbed and lightly armored/padded. There are silver tubes on his chest, arms and legs, presumably some sort of intreface for the exo-armor. He's shorter without his suit - 4⅝" tall - and moves at the Big Five. The toy has no action features beyond the removable armor, which is nice; no flapping wings, no rocket launchers, just Xanatos and his suit. As it should be. 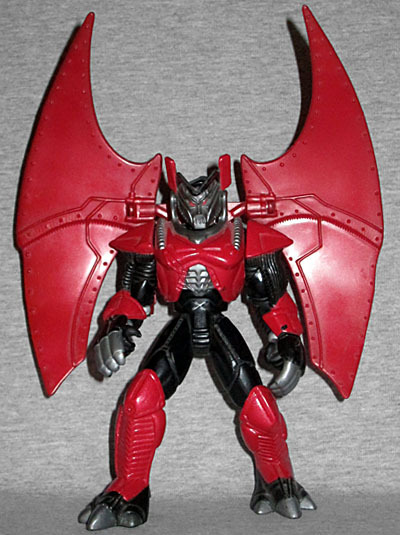 There was a "plain" Xanatos available in the toyline, but only with an expensive vehicle set; if you want someone to hassle Goliath and the rest of the Gargoyles, this is a fine choice.